When it comes to art, I am unsophisticated in my knowledge and understanding of it. I cannot articulate what distinguishes a great work of art from other pieces. I judge the quality of art solely on my own subjective observations, whether I personally feel that it possesses some superior quality that sets it apart and makes my experience of it special in some way. I know what artwork I enjoy, and what I love enough to want to return to it again and again. For most viewers or consumers of art, patrons even, I think that is all that truly matters. One of my favourite getaways is to visit an art gallery. I wander from alcove to alcove, letting the paintings and sculpture lap gently at the shoreline of my mind, waves breaking against the stones of my imagination. The visual feast that spreads before my eyes, displaying a menu of artwork, each piece offering a sampling of ideas, memories, experimental mind-travel… minimalist purity, simplicity in form and subject, a twist of fresh perspective, delicious layers of complicated nuances, or an exotic fusion of foreign concepts that reach beyond my usual “frame of reference”, maybe to be blended with culturally traditional and comfortably familiar symbols. Art can reassure you that you are not alone in your thoughts, making you smile to see that the artist has seen what you see, that you share a perspective. Or maybe the artist challenges you to consider a completely different concept, make you wonder, pose new questions. 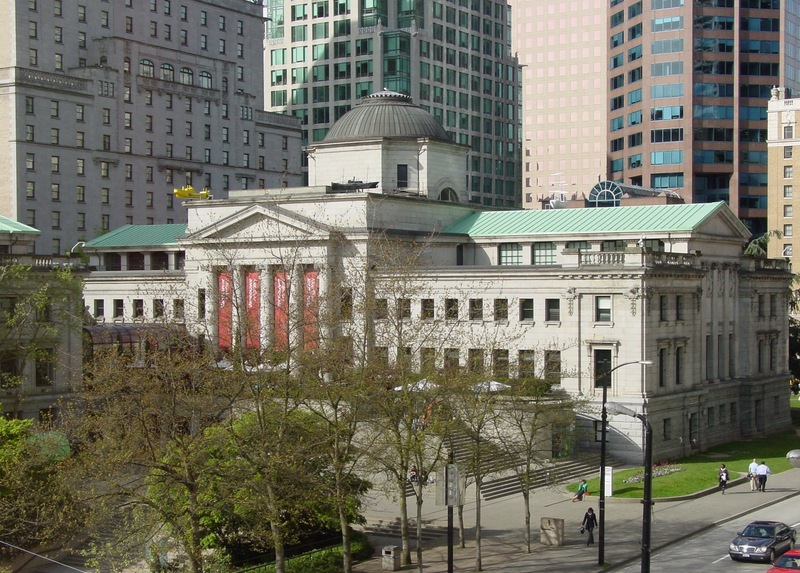 The Vancouver Art Gallery. Photo by Jason Vanderhill, 2006 – JMV on flickr (Creative Commons license, some rights reserved). Sometimes a piece of art is so meaningful, you will want to take it home, or at least some rendition or replica of it. You can recreate that experience privately, from within a favourite room, and maybe you will share it with others. Some of my friends’ homes are replete with wonderful works of art. They may depict aspects of personal family history or ancestry, represent memoirs of special places and times that affected the course of my friend’s life, tell a story that is deeply and personally significant. It is even more meaningful when your friend is actually the artist who created the piece. The artwork hanging upon the walls of our homes, the objets d’art displayed upon our tabletops and credenzas, the music pouring from the speakers of our home sound systems, the stories and poems quoted from the dog-eared pages stored upon our shelves… these works of art become conversation pieces because they offer clues and passageways to our hidden, deeper selves. They make visible or audible the inner treasures of our hearts and minds, in ways we could never otherwise adequately explain. 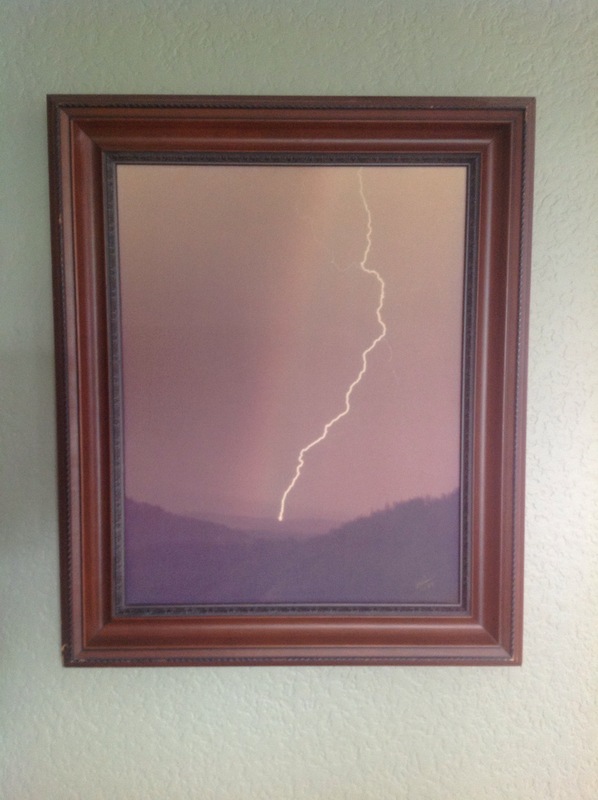 This photograph was taken by a cousin, David Thiessen, during a thunderstorm on our wedding night in July 1982. It hangs in our living room, loved not only for its artistic symbolism, but as a personally significant memento. This past month, I went in search of art that allows me to revisit the personally significant beauty and meaning of the crocus flower. I have already written my personal experience and story, that I call “The Thrumming of the Crocus” (you can read about it here). I have also written a bit about finding this flower within its natural environment (you can read that article here, “Nature Thrums with Crocuses“). Art lets me experience the hope, peace and joy of my crocuses as I will, not just for the brief season they may bloom in my garden, but at any time, no matter what the season. I am in awe of artists. Their possession of unique talent gives them a special mystique. They are creators, possessing the ability to transform something into another form, by design. This is a wondrous and beautiful thing. My search for artwork featuring crocuses brought some talented artists to my attention. I have enjoyed this artistic journey, and reached out to these artists one by one, and was delighted with the responses I received. I saw this oil painting by Debrha Anderson, and was drawn to the vibrancy and focal point of the deep, rich purple of the crocuses she had painted. I have a deep love of the jewel tones – the intensity of the ruby reds, the sapphire and turquoise blues, the emerald greens and amethyst purples. 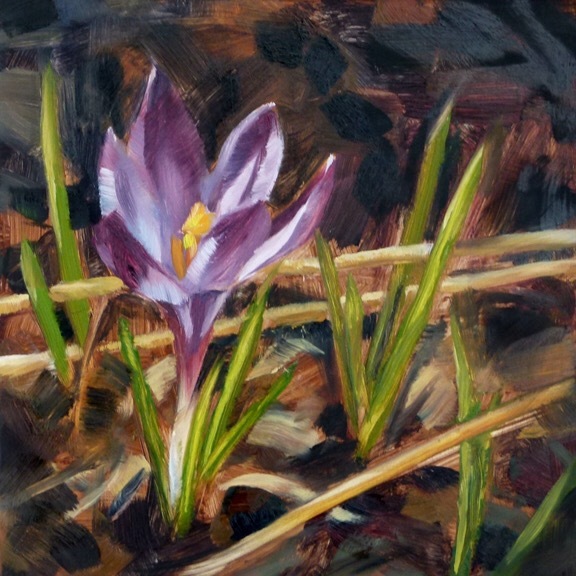 This painting captures the vibrancy of the crocus, juxtaposed against the mulched colours of winter foliage: Oil Painting of Crocuses, by Debrha Anderson, May 2013. Or this: Single Crocus, by Debrha Anderson, 2012. Painting by Debhra Anderson, “Single Crocus”, 2012. Reprinted with the written permission of the artist. The more I paint the more I love it. In between freelance graphic design jobs and family duties, I try to complete one painting a week, more or less. I also enjoy teaching, filling up sketchbooks, gardening, permaculture, photography, and general diy. There’s a book about the artist Robert Irwin called “Seeing is Forgetting The Name of the Thing One Sees”. While my work is nothing like his, I hang onto that phrase when I’m painting, looking at something carefully and long, and losing myself in it, and finding a new sense of awareness and wonder in a carrot or a petal, or whatever it is. You can enjoy Debhra’s painting on her website and blog – “Deb Anderson Painting: One A Week, More or Less“or you can visit Debrha’s Etsy Shop and purchase a painting for your lasting pleasure. 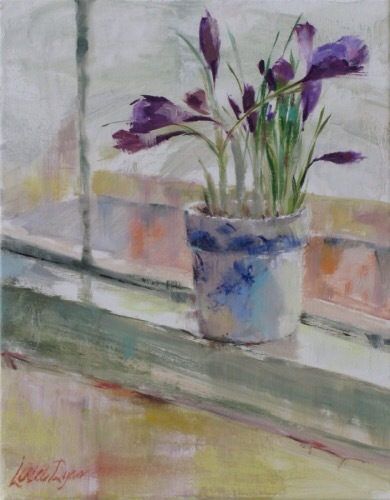 First Crocus, by Leslie Dyas (Oil on linen, 2012). Reprinted with the written permission of the artist. I love the way these crocuses seem to be reaching and feeling their way, searching the space around them as if they desire to better know their surroundings. This painting speaks to me of new or fresh beginnings. For someone who is always on time, I couldn’t have been more surprised to find I was late to the party when it came to seriously pursuing my “fine art side”. After a 5 year degree from a prestigious design program and years in the field as designer and commercial illustrator, I thought I had a pretty good foundation. And I did…but I have so much more to learn! Since resurrecting my calling as a painter, I find that every painting I paint, every masterpiece I study, every class I take brings me to learn that I somehow managed to miss some “duh” fundamentals. I’m a quick learner, though, and have no regrets about my meandering path back to painting. I’m still trying to figure out how to classify or label my style. I’m naturally drawn to impressionism, realism and classical styles, labels which if you could mix ’em together might give you what I am. Today. But then you never know about tomorrow. For all of the reasons that I love stained glass, as I shared in detail in my blog posted here (“Windows For the Soul“), I fell in love with the work of this glassworks artisan, Marilyn (“Mar”) of Gala Gardens Glass Art, makers of quality handmade glass Suncatchers and flowers, created from original designs that bring new dimensions to stained glass and a unique approach to a long treasured art. While I am drawn to her glass crocuses, she has a wide selection of outstanding designs that are delightfully unusual and remarkably beautiful. 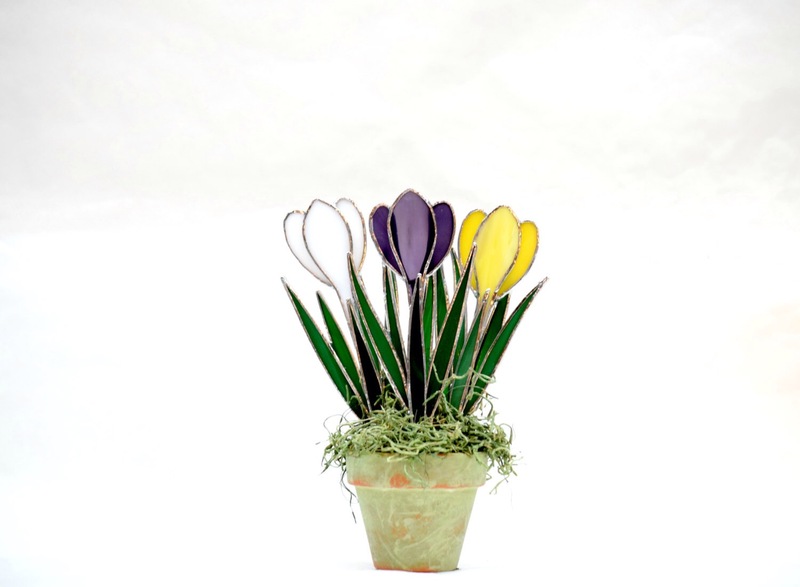 Glass Crocus Flowers, designed and created by Gala Glass Art. Photo reprinted with the written permission of the artist. As a stay at home mom with toddlers, I enjoyed years of travelling the New England area doing craft and art shows exhibiting my stained glass and metal work. When our children became school age my time was more limited and my priorities changed. When they played outside I was there alongside constructing gardens and ponds. More and more the grounds took shape with each year bringing new surprises like a tree frog that stays in a birdhouse, or a owl making a home. My love of our organic gardens and our feathered friends is evident in my craft . Now I have the time to be creative and enjoy bringing a little functional art into someone else’s world. You can read more about her artistry and visit the online studio of Gala Gardens Glass Art here. Throughout my office and my home, beautiful artwork and beloved objets d’art remind me of beautiful people and places, shared memories or private epiphanies that made me who I am today, or changed me in meaningful ways. They thrum to me, generating thoughts about the meaning of life, and about living a life with meaning. Thank you to the artists, each and every one who not only possesses creative talent, but works to share it with others like me.